I have actually made this dress twice before, once in an animal print crepe I made as a gift I don’t think I blogged, and a long sleeved version blogged here. I am probably going to make this dress a couple more times as I am determined to have one that is great. This one came soooo close, but alas I have some issues with it. Mostly with the fabric. Believe it or not, I ironed this dress before the photos were taken! Now, I know I’m a bad ironer, I hate it and iron in more creases than I started with, but this just takes the biscuit! 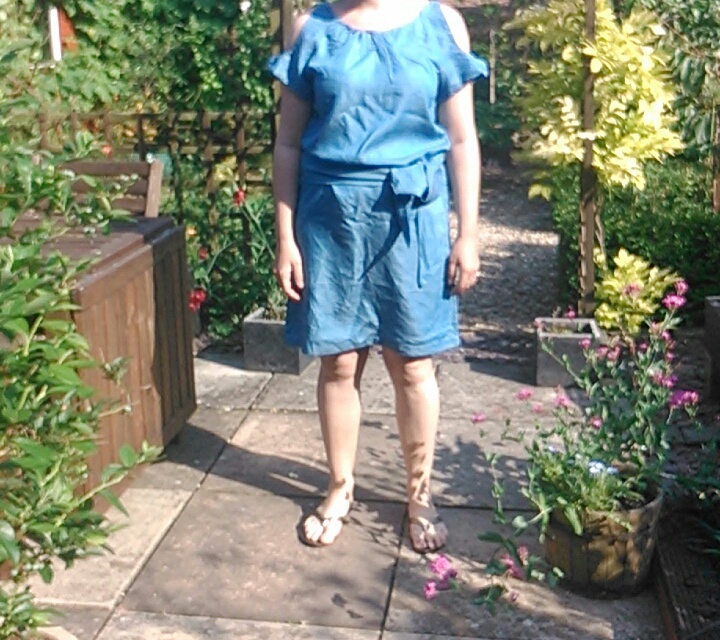 The fabric is a chambray from Truro fabrics, which while it was a delight to sew with, has been a pain to care for, the ironing issue being the most obvious one from these photos. Maybe I just need to iron it when it’s wet. The other problem with the fabric is that I appear to have gotten weird tide marks in places across the dress, sort of bleachy marks that kind of remind me of hard water marks, but really shouldn’t be. I don’t know, it’s an enigma. Generally I am happy with the fit, I left out the pockets because I’m never really going to use them. I put in a zip at the back, but really I should just stitch up the back seam as it slips on over the head easily enough. My two remaining gripes I have with it are the weird bump thing I have on the back, I swear I’m on grain and I’m not sure what’s causing this, maybe I will unpick the zip and stitch up the back, see what this does. The other thing is the sash, it needs to be a bit longer. I may style it with another belt and see what happens. 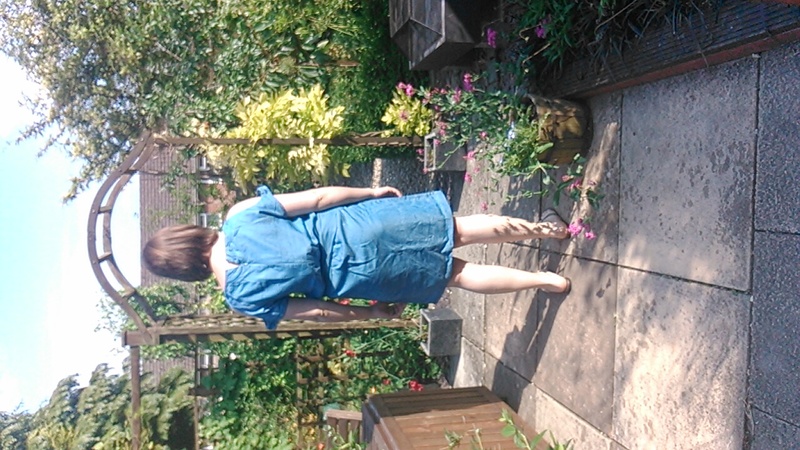 I can’t explain why I like this pattern so much, it is basically a sack relying on a sash for shape, but I am very likely to make at least 2 more of these, another cold shoulder (this view) I’d like a dark blue like the one in the picture, and a sleeveless one, maybe in a patterned cotton. These are both some way off though, my sewing projects list is about a mile long at the moment, I’ve really got the bug after not sewing for me at all while I was pregnant.